New Roof For Greenwich Pier, But When Will The New Bits Open? Lindsey New Roof For Greenwich Pier, But When Will The New Bits Open? TfL today announced the beginning of work on a roof and lighting scheme for Greenwich Pier. It will be ready for the Olympics. Greenwich Pier will be an important travel hub for equestrian spectators, so it's good news for them that the pier will be spick, span, covered and lit by the time they arrive. 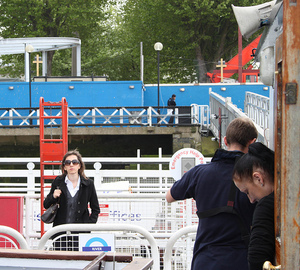 Locals and visitors, however, have had to put up with a makeshift pier – behold, the Greenwich Labyrinth! – for yonks. Redevelopment work to add new pavilions and a modern ticket office foundered and apparently stopped, as described by Andrew Gilligan back in 2009. The Greenwich Phantom got wind of an update in February 2011, suggesting that stuff had, in fact, been going on underground and that the work would be completed in the summer. A trip down there for Greenwich Comedy Festival in September confirmed it was still makeshift. However, the Visit Greenwich blog says a "completely refurbished Greenwich Pier sets sail in the late Summer or early Autumn". The TfL press release does say that the pier will not close for any of the roofing and lighting works. It doesn't say when exactly the nice new bits will be open for use. By 2012 for sure, though, right? UPDATE 17.10.11: we've had an email from TfL clarifying that the new pier will be ready by the end of the November and word from locals that something's definitely happening down there - let us know if you're using it regularly. In other Greenwich news, Darryl at 853 laments that the Thames Path from the North Peninsula to Greenwich town centre will remain shut through the Olympics, missing the opportunity to enable Games spectators to walk between two key Games sites along the river.